Keeping it Cheery anecdotes from a life in Brigton by Bill Shackleton. 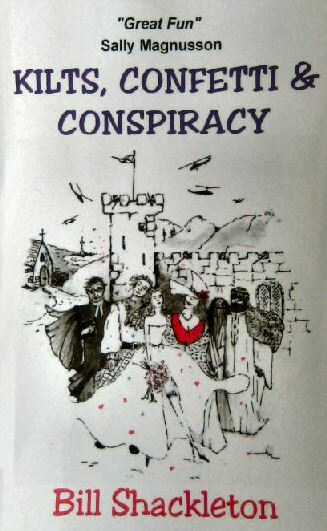 His book takes you a dauner through the Glasgow of yesteryear; meet characters, read anecdotes from the famous and the infamous, experience the history of the Church in Bridgeton from the inside, and enjoy this nostaligic. hilarious romp through five decades ( yes five decades) of the Brigton Youth Club, Church House. This book will amuse and enlighten many readers it is full of rich experiences expertly and amusingly told. 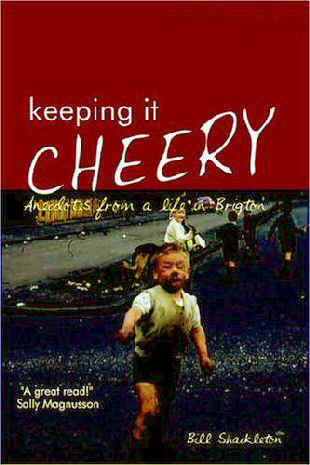 Its a magnificent book about Glasgow, its chancy, defiant, cheeky, gallus people. If laughter is the best medicine this book is just what the doctor ordered. ...gonnae no' dae that mister, eh? Its a personal story, a light hearted look at the lengthy ministry in a working class parish that was Bridgeton in the east end of Glasgow, a church called St.Francis-in-the-east and its offshoot, Church House Youth Centre. Church House is a youth and community centre in a rough working class area between Bridgeton Cross and Parkhead in the east end of Glasgow, founded during the second world war. It is fifty years since Bill Shackleton became involved there and in his heart he has never left it. being retired nowadays he helps raise money for the club. Long ago he heard a line "Don't over-estimate yourself: you can do very little for the really bad boy, and the good boy doesn't need you: but for the great mass of boys in between, you can do far more than you realise"
This book offers great advice to young teachers and novice youth workers with its practical and sage advice, imparted lightly and without the slightest pomposity about how to work with alienated or difficult young people. When describing the phenomenon that is the Rev.Bill Shackleton, it becomes difficult to avoid over use of the word 'incorrigible'. Many have experienced his teasing humour more have fallen over and rolled around the aisles helpless in the face of a no-holds barred comedic genius. He became an assistant in St.Francis-in-the-east Church in 1955 becoming the parish minister in 1960 and with it the responsibility of Church House Youth Centre - his first love. One September Sunday in 1955 as he waited to follow the beadle into the church to start his first service in St.Francis-in-the-east, the beadle turned and whispered to him, "keep it cheery, Bill, keep it cheery"
He little realised how difficult it would be at times to keep it cheery during the wild and wonderful years that lay ahead of him in Bridgeton. GlescaPals webmaister :- Well pals I first met the Rev.Bill Shackleton when I started school as a wee five year old boy in Bridgeton. His book is a fascinating read, full of wonderful, sad, funny, moving stories of his life working and living in Brigton.....and the many 'coincidences' that shaped his life. I highly recommend this book. 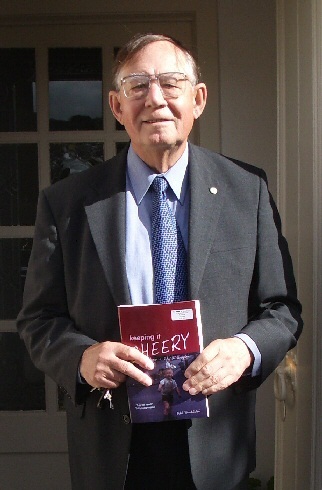 Bill Shackleton, has managed to combine a career as a Church of Scotland minister with a rumbustious good humour which has disconcerted both his various congregations and the nation for years. Thus this latest opus of his, his first foray into the novel, though not fiction. He has been at fiction for decades. In this book you will find indeed a Scottish minister: in fact you will find two and that is for you to find out. The Rev.Archie McTaggart is a comic creation which I suspect will last for long. The rest of the cast list - his wife Margaret, his mother-in-law (who I rather liked) and his dreadful sons. One a disastrous GP, the other a cabinet minister - and no matter the calamity a doctor can create it is nothing to that , according to Archie McTaggart, which a cabinet minister chap can inflict. .....Hi, I was wondering if you could send instructions on how best to pay for a copy of Bill Shackleton's book, preferably a signed copy. I was fortunate enough to have this unique gentleman, and his lovely children Scott, Joy and Allison be part of my life for some memorable years when he was the minister at Wellpark West in Greenock. Little does he realise the profound effect he had on me, or my faith and relationship with God. He was also instrumental, at various times, (and Lord alone knows how), in having me play Scrooge for the nativity and a Doctor at a memorable and very eventful retreat in England. The least said about my questioning of faith at a retreat the better I think (although Bill would have been able for the questions - the poor guy that ran it wasn't). To this day I have never forgotten Maureen Telfer's hard stare or Bill's wry and amused smile for the squirming of the retreat leader.